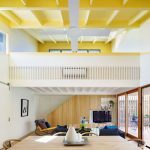 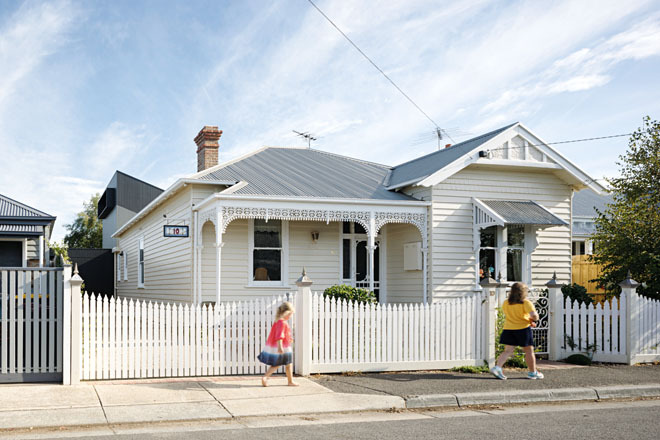 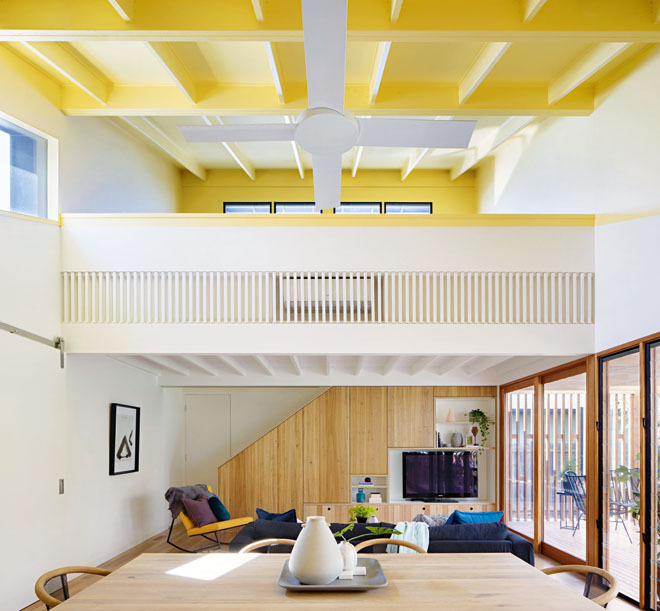 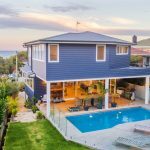 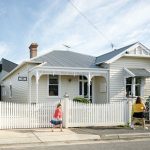 The high-ceilinged and high-achieving Joyful House is the quirky addition to an original weatherboard worker’s cottage built in the early 1900s. 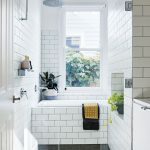 Confronted with a budget tighter than a newborn baby’s skin and a brief with loftier ambitions than Trump’s, the architects at Mihaly Slocombe had their work cut out for them when clients Zytel and Matt approached the firm and requested a renovation to create a “forever home” by opening up the rear of their property. 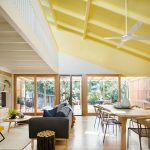 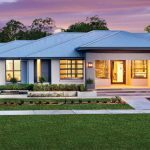 With the birth of their third child, the clients hoped to add multiple light-filled spaces conducive to energetic family fun. 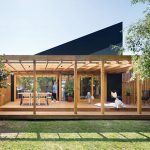 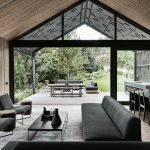 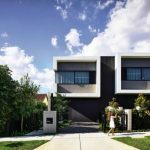 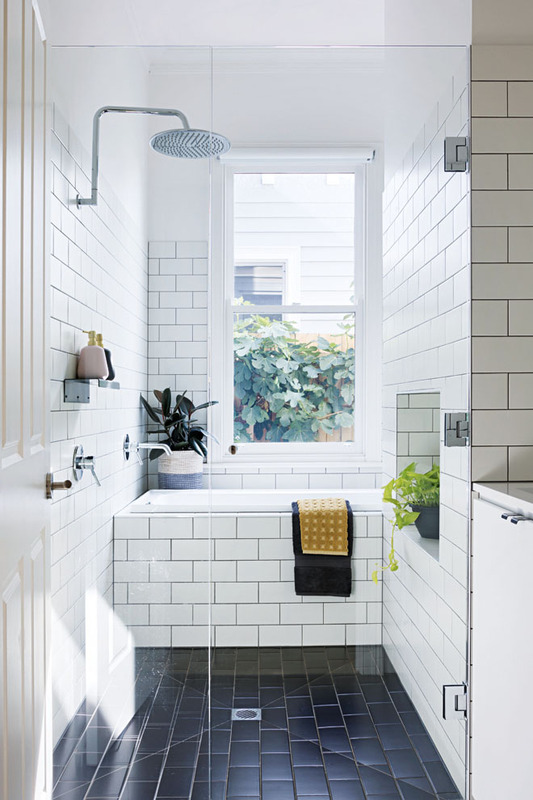 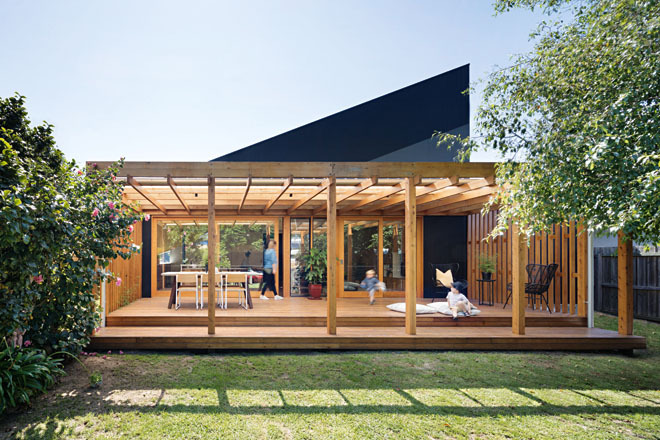 The double-fronted Edwardian worker’s cottage, with white weatherboard cladding and galvanised steel roof, is contrasted by the renovated addition, which is triangular in form and clad in black lightweight cement sheeting. 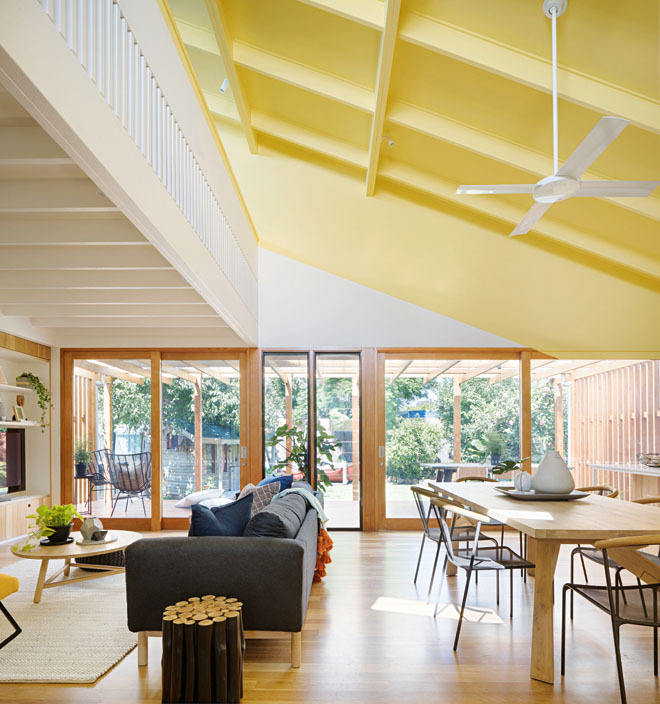 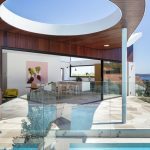 A sloping roof, considered window placement and translucent fibreglass roof covering the deck have resulted in a living space infused with natural light and overlooked by a mezzanine retreat peeping out from above. 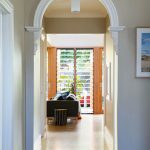 To minimise costs, the original bedrooms were preserved so the limited budget could be spent on new service areas and a flexible living room connected to a spacious back garden. 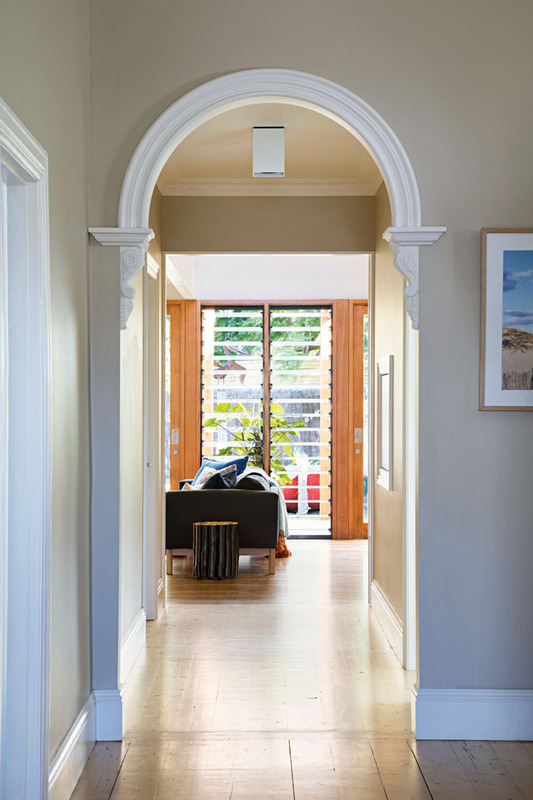 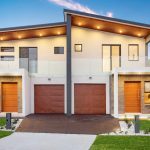 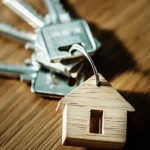 With standard construction processes combined with modest materials, the outstanding results were achieved for a steal. 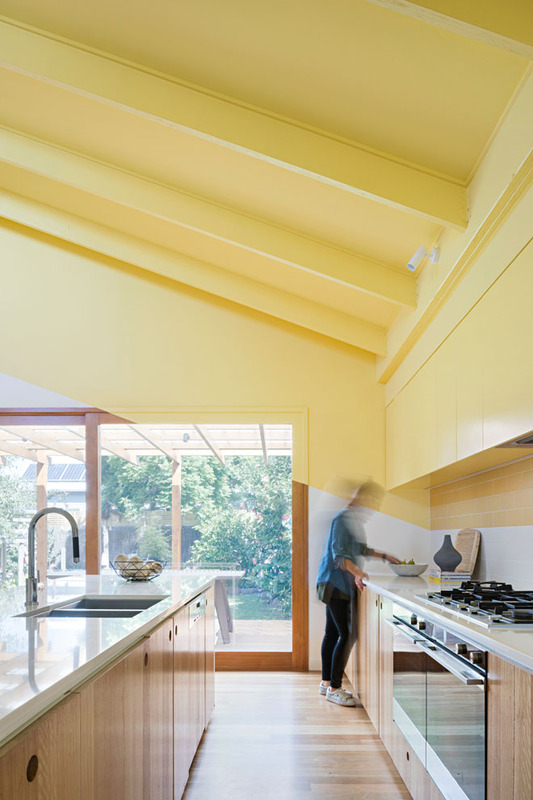 Swathed in Dulux Joyful, the roof, ceiling and upper walls in the living room scream sunshine and happiness. 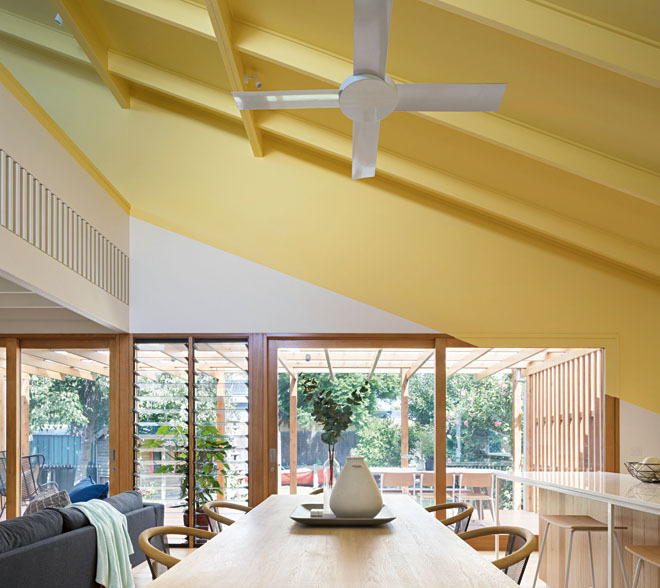 They also reflect the vibrant family who reside within its semi-yellow walls. 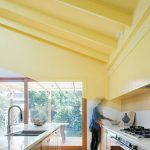 The ability of Joyful House to reinvent itself and adapt to the family as their needs change is one of this project’s greatest successes. 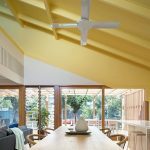 Another is the way the south-facing facade that opens to the back garden has been designed with illumination and access to cooling breezes in mind.